The century-old, 830-foot long Veazie Dam on Maine’s Penobscot River, a river once rich with wild Atlantic salmon and other fish, is the most recent dam structure to fall in the state as environmental groups, state and federal governments and businesses work together to restore habitat for vital species. Demolition of the dam began in late July, part of the largest river restoration project in the world and the 27th dam to be removed in Maine. When completed, the endangered salmon, American shad, river herring, endangered shortnose sturgeon, threatened Atlantic sturgeon, striped bass, rainbow smelt and tomcod will have a chance to return to their 1,000 miles of native waters to feed and spawn. Throughout the Gulf of Maine region, scores of habitat restoration projects are taking place, many resulting from the combined efforts of diverse groups. A participant in many of the projects is the Corporate Wetlands Restoration Partnership (CWRP), a collaboration that originated in Massachusetts in 1999 between several corporations, the state Office of Energy and Environmental Affairs and other agencies. Initially, the partnership formed to increase private sector participation and funding to work on wetland projects, but quickly expanded to include other aquatic restorations. Then the idea rapidly spread to other states as well. 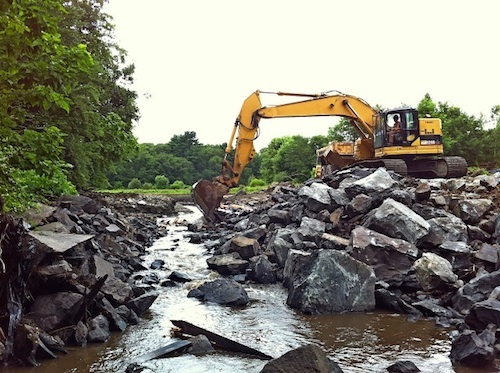 An example of a project that includes CWRP funding in Massachusetts is the Whittenton Dam Removal project which demolished the remainder of a 170-year-old wooden dam on the Mill River. In October 2005, torrential rains nearly breached the dam, threatening to flood the town of Taunton. One thousand residents were evacuated. The Flanders Stream Road Crossing and Fish Passage project in Sullivan, Maine, installed a series of nature-like rock weirs to increase the water levels in much the same way a concrete fish ladder does, but in a structure that requires little to no maintenance and is pleasing to the eye. In the background is a new culvert road crossing, which replaced the town’s failing, undersized culvert and is designed to perform to Stream-Smart principles developed in Maine. Flanders Pond, upstream, provides hundreds of acres of alewife spawning habitat. After that, the structure with its suspended wooden walkway was dismantled and a stone spillway installed in its place. Some stones have since shifted which made demolition and restoration even more pressing. The Massachusetts CWRP donated $20,000 toward demolition of the dam that began in mid-July. Nearby Hopewell Mills Dam was removed last year and already officials say underwater video shows herring are running through the former site. Removal of Whittenton Dam, officials predict, will reconnect Mill River to 30 miles of tributaries, lakes and ponds that flow through the Taunton River as far as Narragansett Bay, allowing herring and American eels to return to the river. Corporate members of Massachusetts CWRP pay organization dues that help fund the projects, explained Hunt Durey, with the Massachusetts Division of Ecosystem Restoration, who works with the GOMC and CWRP. State board members are drawn from members of private companies, with ex-officio or non-voting members from state and federal agencies and conservation groups. The Flanders Stream Road Crossing and Fish Passage project is in Sullivan, Maine, to which CWRP contributed $24,000. 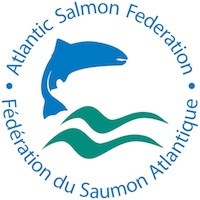 Other funders for this particular project included the town of Sullivan, the Gulf of Maine Council on the Marine Environment-National Oceanic and Atmospheric Administration (GOMC-NOAA) Restoration Partnership, the U.S. Fish and Wildlife Service (USFWS), Maine Department of Marine Resources (DMR) and the Maine Natural Resources Conservation Program. “One of the important aspects of the CWRP funding is not only that it provides a much needed source of funding in a state with few ‘home-grown’ funding programs, but it also acts as a source of valuable ‘non-federal’ matching funds that must be generated to qualify for some federal restoration funding programs,” said Slade Moore, Habitat Restoration Coordinator for the GOMC and the Maine Coastal Program (MCP) Bureau of Geology, Natural Areas, and Coastal Resources. “This project is a great example of municipal, state, federal and CWRP collaboration,” said Moore. “We are looking to reestablish alewives in this Downeast stream.” The project developed a restoration design to replace and redesign a failing culvert on a road that services 20 families located near an alewife spawning area. Habitat restoration is an important element in the GOMC’s Action Plan and this project, like so many, fills a few ecological needs. Alewives have economic as well as ecological value—they provide a source of lobster bait early in the season. Many failing culverts also prove a hindrance to the passage of wildlife. Often they are an eyesore on the landscape as well. Besides dam removal, the kinds of projects aided by CWRP also include restoring fishways and saltmarshes. The banks required restoration after the Whittenton Dam was removed on the Mill River in Massachusetts. (Photo: MA Division of Ecological Restoration). 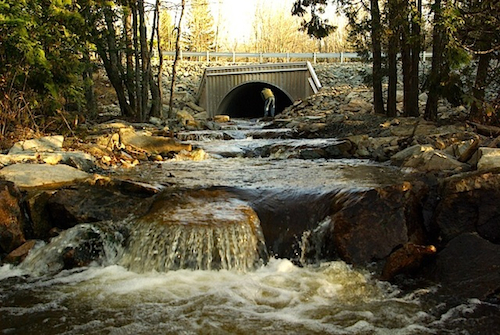 One such project is the Warren Brook in Alstead, New Hampshire, a waterway that was “scoured,” said Laurence, by a extremely unusual heavy rainfall that dumped between 12 and 16 inches in some spots during the so-called Mother’s Day storm in 2005. Banks of the brook washed away including some parts of the roadbed. Restoration required engineering and construction work. Pointing up the differences in the types of projects funded by CWRP, Laurence also cited the reseeding of the Great Bay oyster beds, done in conjunction with the Nature Conservancy as part of a much larger Great Bay restoration project. Oysters had been decimated by a disease in 1995. While the Maine CWRP did not directly fund Maine’s Veazie Dam removal project, the group was involved nonetheless—one of the corporate partners donated extensive, in-kind legal advice. McLachlan worked in Maine when Spectra Energy built the gas pipeline through the state in 1999. In 2001, he helped start Maine CWRP. Since the start, he estimates CWRP has contributed about $500,000 to more than 50 projects and leveraged twice that in agency funding. Since CWRP is an all-volunteer organization, no one has much time to seek out additional corporate partners, so the fund-raising takes place through word-of-mouth between agency people, NGOs and CWRP corporate members.